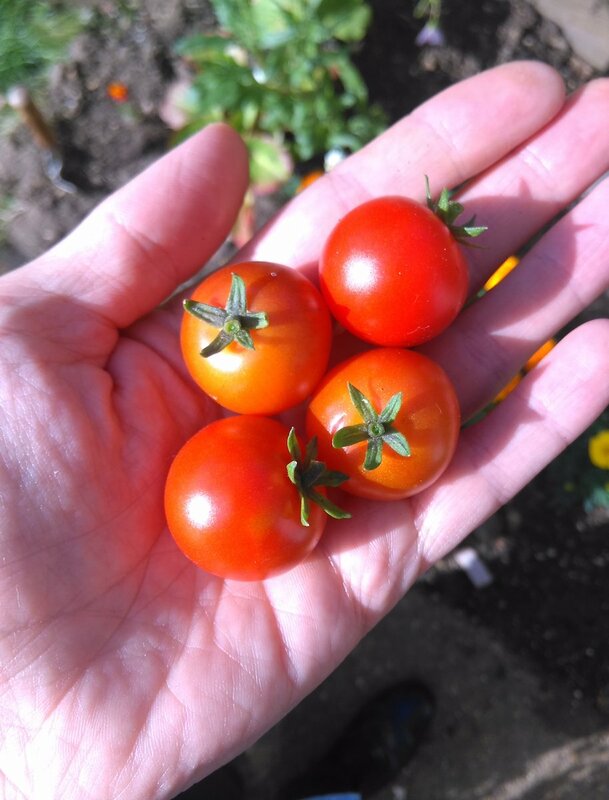 My Tomato ‘Minibel’ plants are beginning to regularly provide me with some juicy red cherry tomatoes, a little over 4 months after I sowed them. They’ve been a tough grow as usual, because they are desperate to fall over 10 times a day, particularly when there’s no breeze, and they’re always fried. I go through this each year, but this year seems to be the first one where I’ve got quite a few tomatoes on the plant. These were the first batch of red ‘Minibel’ tomatoes of 2017. 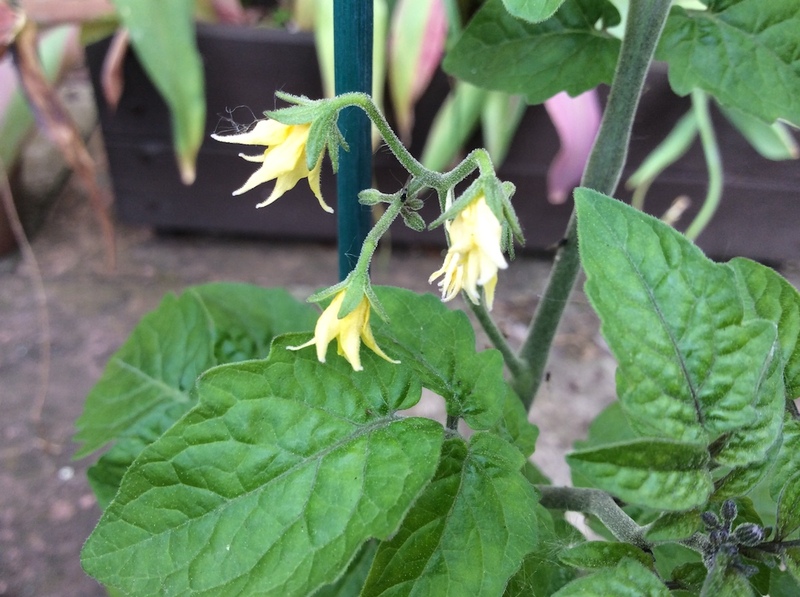 I’ve already enjoyed eating my first batch of red tomatoes, but there’s plenty of green ones yet to ripen. When I look back to 2013 at my previous house, it wasn’t until the middle of September that this variety would finally yield a crop. However, that was a shadier garden, and these are in the south-facing garden for most of the day, being roasted by the sunshine. The tomatoes have overcome blackfly, which I only gave one treatment of the old washing-up liquid wash too. Spot the Blackfly marching up and down the Tomato ‘Minibel’ plant. Their sap sucking holiday came to an end. I eat a lot of salads, so it’s been great to get to now pick tomatoes, that go alongside my home grown lettuce leaves. I’ve learnt that the slugs in my garden don’t seem to like red leaf lettuce, or a crinkly variety that were both in the old ‘sow by 2012’ Erin seed kit that I almost threw away, but gave a chance and grew a forest. 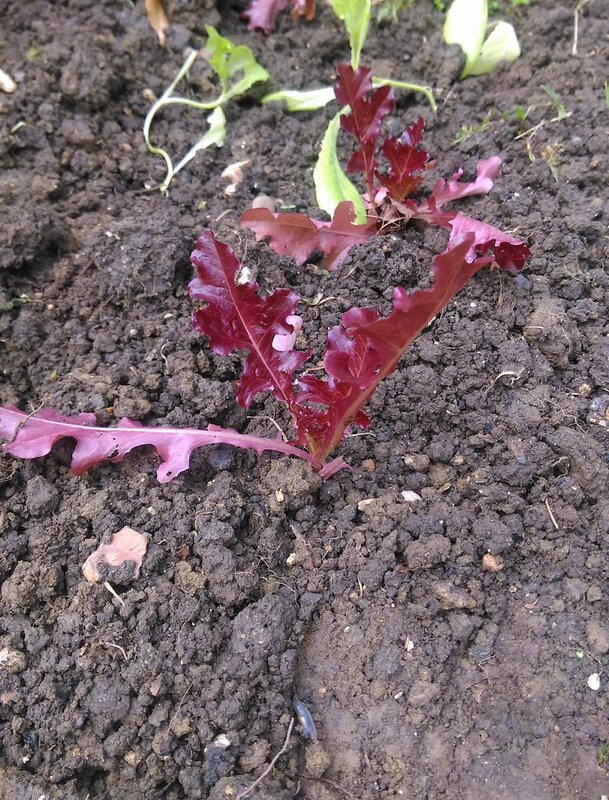 The slugs don’t seem to like these red-leafed lettuces that I planted in my new veg garden back in May 2017. I’ll grow some more. So, now that a few of these plants have bolted, and it feels like the plants are getting a bit old, I’m aiming at sowing some more of these this week so that I can extend my season. Sadly, on the other side of the garden, the Squash ‘Spaghetti Stripetti’ plant is under attack, and as it is now covering about 15 feet radius, it’s looking a bit sad. The outer edges are still roaring across my lawn, with wide open flowers, and more little squashes forming (i’m up to about 10 now, from one plant). The culprit this time is the frosty white powery layer called Mildew. Mildew coats each leaf and blots out the sunshine, therefore slowing down the plants ability to photosynthesise, and therefore it dies. I’ve seen this before, when it killed off some of my courgettes at my old house, but this time it really has taken hold, and fast. When the Squash and the Courgettes began to rapidly grow, I did realise that they were too close together, but as they were so desperate to go outside (having been waiting for my house move), I decided to let them go out whilst I followed up with creating the rest of the garden around them. The downside to this close planting is that the compact space in which their leaves have grown, means that the cool breeze has not been able to get amongst the leaves and dry them – resulting in this damp environment where this mildew mold (it’s a fungi) can thrive. 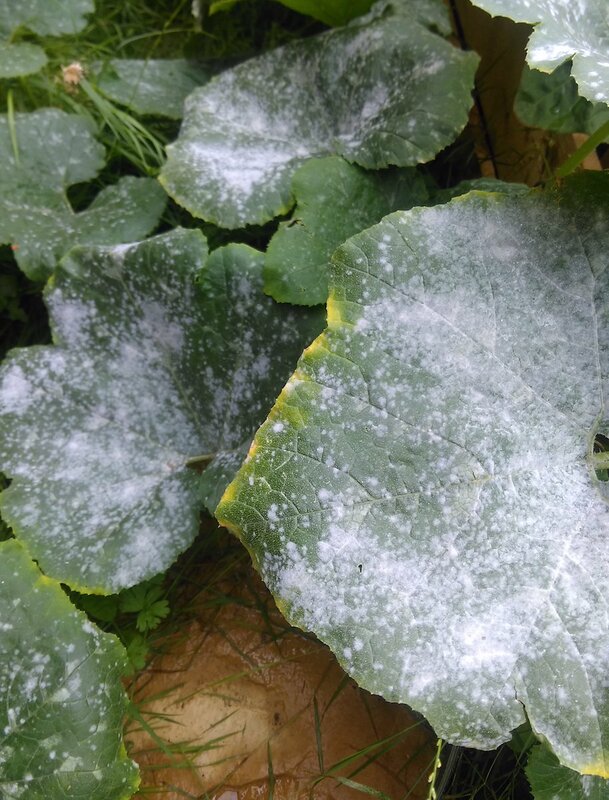 The white powdery Mildew has taken hold of my Squash and Courgette plants. Left, it’ll starve the plant of sunshine and kill it. I’ve bought some spray (coincidentally the one recommended by the RHS), and I’ve sprayed most of the infected leaves, and the nearby Courgette ‘Black Beauty’ plants, and hope that the plant stays alive long enough to finish ripening its many squashes. I’ve also previously given it a spray with watered down milk – I read online somewhere that this introduces a protein that kills the mildew… but I don’t think my skimmed milk is really going to help much. My garden looks a bit like a winter wonderland… but hopefully it’ll live long enough to reward me with my first ever crop of squashes. Any ideas to deal with the mildew is gladly received, but in the meantime, thanks for reading, and happy gardening.